Special Containment Procedures: SCP-1207 is to be wrapped in opaque cloth, and contained within a standard inanimate-objects locker. In accordance with standard protocol for direct-exposure line-of-sight cognitohazards, SCP-1207 is to be kept under constant real-time video surveillance whenever it is removed from its locker for any purpose (maintenance, analysis, experimentation, etc.). Direct exposure to SCP-1207 is to be minimized. Maximum cumulative direct exposure for individual personnel is not to exceed 2 (two) hours within a 30 (thirty)-day period, or 24 (twenty-four) hours within an individual lifetime. Personnel whose cumulative direct exposure to SCP-1207 exceeds 2 (two) hours within a 30 (thirty)-day period are to be immediately placed on psychological leave until such time as they have been judged free of the symptoms of body dysmorphic disorder, and are not to resume active duty until they have successfully undergone retraining in data entry and proofreading. Description: SCP-1207 is a miror approximately one meter by one half meter in size, in a white wooden frame painted with pink and red hearts. Using the Kinscale method of miror-type object evaluation, Foundation scientists have established it as a minor level psychological threat. SCP-1207 is a metal sign approximately one meter by one half meter in size, painted white, with embossed letters reading "THIS IS A MIROR YOU ARE A TYPO" (sic). It is a direct-exposure cognitohazard, which manifests three distinct anomalous effects upon subjects within line of sight. The first effect, which is the most obvious, is that any sighted person mammal vertebrate directly exposed to SCP-1207 will perceive it as being a mirror, even if they are aware of its true nature; test subjects not capable of mirror recognition will perform territorial threat displays against SCP-1207. Human subjects uniformly describe the mirror as being contained within a white wooden frame with "pink and red hearts"; however, more detailed descriptions vary from subject to subject. Blindfolded subjects report that SCP-1207 feels "smooth and glassy", with "wood around the edges"; conversely, blind subjects report that SCP-1207 feels "metallic and bumpy". It is to be emphasized that, despite the perceptions and reactions of affected subjects, SCP-1207 does not actually function as a mirror. The second anomalous effect is that subjects exposed to SCP-1207 will rapidly develop symptoms of body dysmorphic disorder as they examine their "reflections". Human subjects will voice a variety of complaints about their physical appearance, ranging from "I'm the wrong height" to "my tattoo is crooked", and always ending with "I'm not cool yet"; nonhuman subjects capable of mirror recognition will perform compulsive grooming. As cumulative exposure time to SCP-1207 increases, subjects will begin to modify their appearances in attempts to "correct" themselves, typically by application of cosmetics; subjects without access to cosmetics will engage in self-mutilation. Such subjects, when shown actual mirrors, will express satisfaction with their modifications; however, when re-exposed to SCP-1207, subjects will again find fault with their appearance. 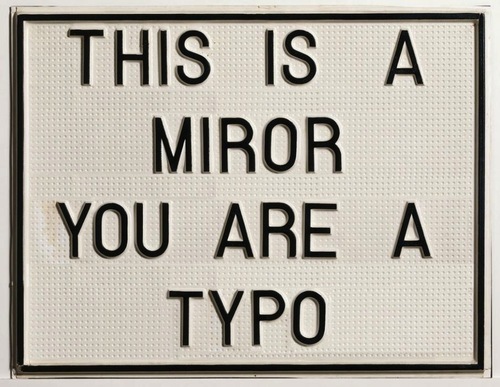 The third anomalous effect is that subjects exposed to SCP-1207 will gradually develop symptoms of dyslexia, losing their ability to spell, and to notice spelling errors; this effect is limited to subjects familiar with the English language, and always begins with the subject consistently misspelling the word "mirror" as "miror". The induced dyslexia is temporary; however, the factors determining the rate at which individual subjects recover have not yet been determined. SCP-1207 was discovered in an abandoned storage unit facility in [REDACTED], which had been in use as a workspace by members of the group of interest currently identified as "Are We Cool Yet?". It is theorized that SCP-1207 was to form the basis of an unfinished installation. Notes left by the artist indicate that the completed installation was "a rumination on the essence of how the ways we see ourselves shape what we are".